It's midnight, I'm sat on a plane next to a middle-aged man who has fallen asleep on his wife and I've just finished Splintered Light by Cate Sampson*. I put it down and smile because it was a really good book and I loved Leah, the female character. I'm inspired, I loved her, I put her in the kickass female characters category with Katniss and Michonne. A couple of days later this posts drops into my inbox and I'm grinning from ear to ear. 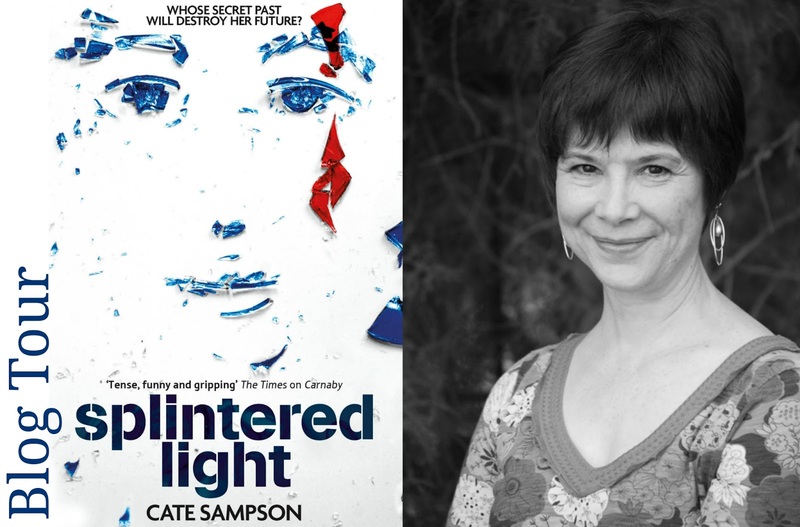 Today on Imogen's Typewriter I give you Cate Sampson, the author of Splintered Light, talking about Young Women who Fight. I was worried about making my female protagonist a kickboxer. I didn’t want the ghost of Karate Kid hanging over her, and I didn’t want kickboxing to be the most important thing about her. Nor did I want the fact that she was a fighter to become shorthand for ‘feisty’ or ‘gutsy’, the kind of patronising adjectives which suggest girls in skirts and sensible shoes from the Famous Five. But after I’d visited Massimo Gaetani’s Carisma Kickboxing club in Cambridge, I knew I wanted to place her in a club just like that, with its mixture of explosive energy, ritualised aggression and camaraderie. It’s a place where there is danger, but it is also a place of self-control. I keep talking about ‘her’ and ‘she’. ‘She’ is Leah, one of three teenagers at the heart of my new book, Splintered Light. Leah’s mother was murdered twelve years before the book begins, and Leah lives with her father, a police officer, who wants her to learn to fight to protect herself from the kind of danger that killed her mother. He is endlessly anxious about Leah’s security, urging her always to fear. And yet he spends swathes of time away from her, leaving her to look after herself while he vanishes on jobs Leah knows nothing of. Leah pretty much brings herself up, and mostly she does the opposite of everything her father wants her to do. He says no social media, she’s on everything. He says don’t ask questions about the past, she asks questions. She loves kickboxing despite the fact it was her father’s idea. Not because she’s afraid, but because she’s good at it, because she likes the way it makes her feel in her skin, and because she’s found a loose-knit home there, among her fellow students. Most importantly, it’s a place where she’s in control, of her body, and her mind. At the Carisma kickboxing club the day I went to watch the class there was a scattering of girls among the men, one or two young teenagers still early in their training and women in their twenties who were already kicking machines, focused and disciplined, their muscles performing exactly as they were told. There were powerful men and weaker, or less confident, men, just as there were powerful women and weaker, or less confident, women. There were men who didn’t mind getting hit, and men who did. So with the women. And make no mistake, this is a contact sport. When you get hit, it hurts. You could see it in the flinching, eye-closing moments when less advanced students let their guards down. But what was almost palpable was the focus and the discipline, and the mutual respect, the weaker for the more powerful, and the other way around. No one blindly hits out. If a strong boxer finds himself up against a weaker boxer, he holds back. It might be different in competition, but in the gym there is recognition that just because you can hurt someone doesn’t mean you should. Indeed, Massimo Gaetani always tells his students that the best defence is to run away – you never know when someone’s got a knife or a gun, and that trumps any clever move. I found my inspiration for Leah in British women who have become champion fighters. Nicola Adams was the first female boxing champion at the Olympics, and then at the Commonwealth Games. In an interview with The Guardian newspaper she described how the boxing club had become a refuge for her in her teen years, ‘almost like another family,’ the coaches becoming father substitutes. Brought up by a single mother, who nearly died when she was thirteen, Nicola Adams faced similar hardships to those faced by my fictional Leah. So too Ruqsana Begum, British women’s Muay Thai champion. As a Muslim teenager, she had to overcome the cultural expectations of her family to become involved in martial arts. Both Nicola Adams and Ruqsana Begum have been involved in the Fight For Peace organisation, which works worldwide to redirect the energy of young people who might become gang members. They teach young people control and discipline, and that fighting can be kept off the streets and inside the ring. In Splintered Light, when Leah comes across a young man who is involved in crime and violence, it is a similar message that she passes on. There may be pain in boxing, but there is pleasure too, and much of that pleasure and the confidence that comes from the discovery of self control. I really recommend Splintered Light if you're looking for a good contemporary YA novel. And thank you to Cate for this post! *I received this book as part of the blog tour. It has not changed my opinion at all.